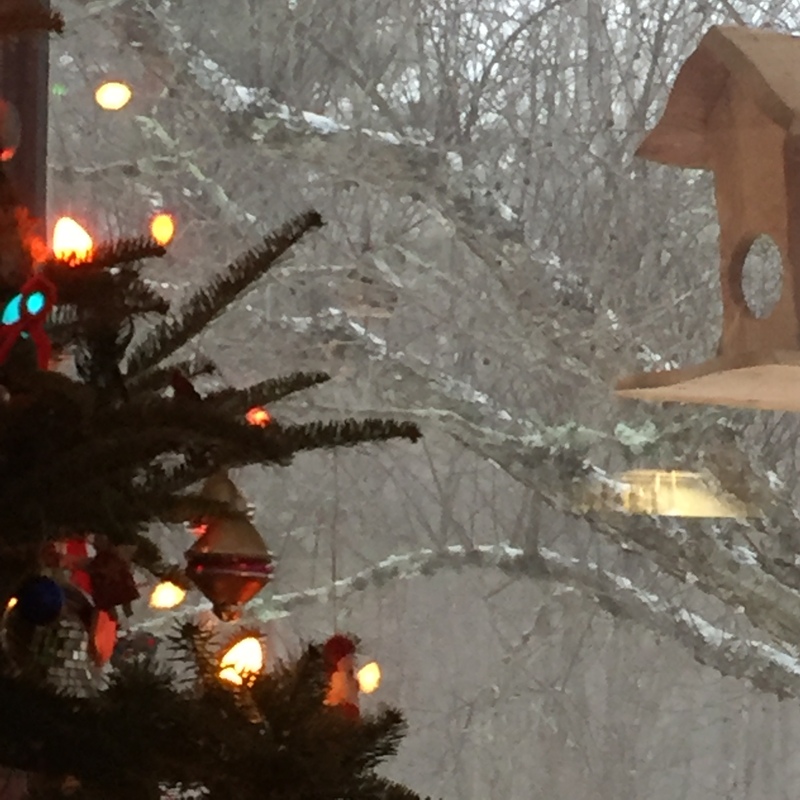 I love the gift of bird feeder and bird house from my parents. Both are artisan crafted, one of a kind spectacular creations in wood. 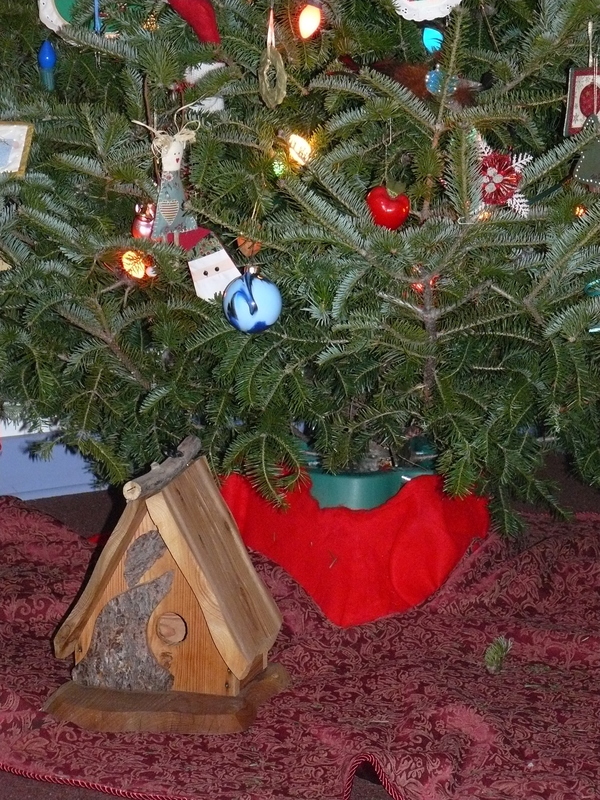 The birdhouse is sitting under the Christmas tree right now, waiting to be placed in the gorgeous tree outside my porch. The open feeder is a glorious platform with roof that comes with a significant pole that can be greased, for keeping the squirrels on the ground and not in the feeder eating all the sunflower seeds. Finding a place for this feeder has been an interesting project. 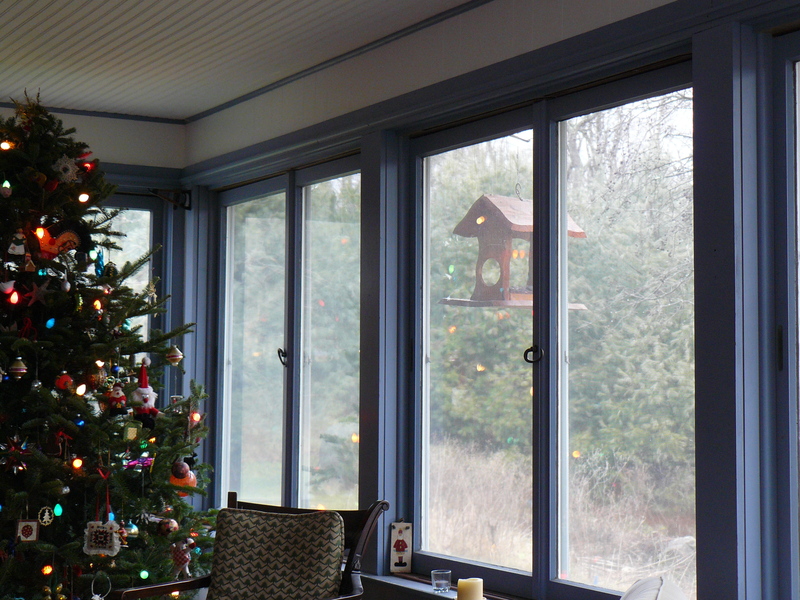 In the balmy days of this years Christmas week, we tried out many locations for the feeder. I soon discovered having an immediate dislike to seeing any kind of object on a pole in any part of the view I have become so accustomed to. Anything man-made felt like a violation. Surprised and a bit dismayed by this reaction, I realized I needed time to process exactly how I wanted to be in relationship to the birds that would eventually swarm this feeder. I eventually realized that this feeder needed to feel as natural a part of the perceived landscape here as anything else. Finally a place made itself known, just outside the porch windows under the eave, hanging from a hook that was already there. 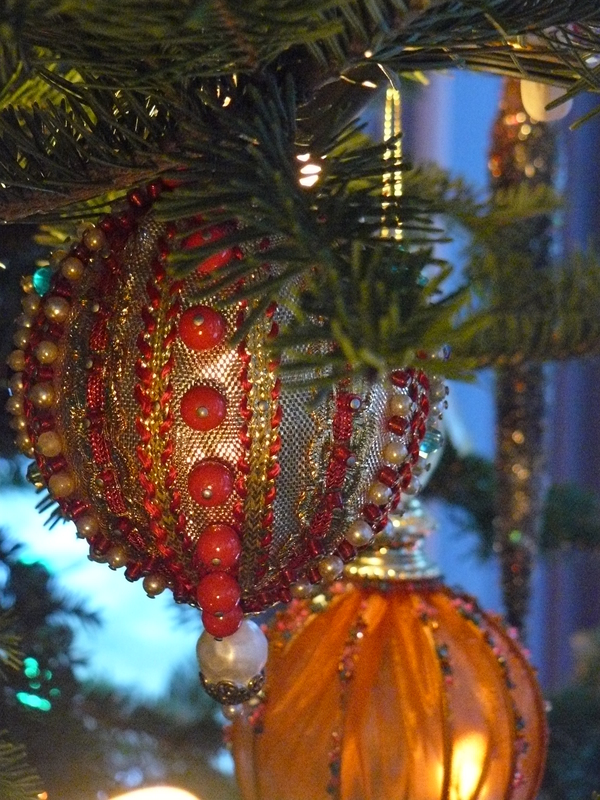 Suggesting that this beautiful object be dangled from the house like an ornament on the tree…. So it has hung for the past four days. I am watching for the visitors. Acutely aware that the starkness outside, that the absence of bird life for weeks now may have more to do with seasonal migration that actual food available in this place at this time. My focus turns back inside to the food that HAS drawn visitors here for the past week. To the large pot roast prepared for my parents’ arrival days before Christmas. A pot filled with a tomatoey melt in your mouth beef chuck on a bone. A soup/stew simmered slowly for over five hours, with ample addition of carrots and onions to make this a truly memorable vessel of nourishment. There was heartfelt registering of the beef and vegetables that all came from my local farm share. We feasted on this one pot for days leading up to Christmas, accompanied by mashed potatoes one night, rice another, and crunchy green salads each time. The theme continued into Christmas dinner, and sharing with even more visiting friends and family. 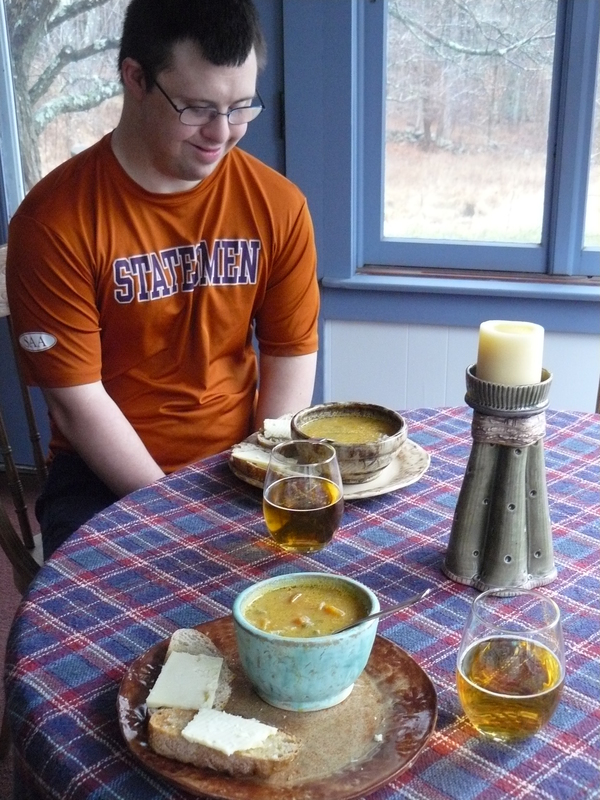 My father created a most memorable butternut squash soup to accompany the roast chicken and vegetables dinner. Gorgeous golden orange soup carrying more of the richness of our beloved local produce, lovingly prepared, lovingly appreciated by all. The day after Christmas I made a huge pot of vegetable soup ala Marcella Hazan, sautéing each vegetable addition to the pot, one after another until the pot was full of fragrant earthiness. First the onions in olive oil, then celery, carrots, green beans, leeks, potatoes, a package of home preserved frozen corn from the end of summer, potatoes, rutabaga, a jar of home canned tomatoes, leftover chunks of butternut squash from the day before. All simmered for hours in a mixture of chicken and vegetable stock with a crust of Parmesan thrown in. Enough for more days of meals, for sending Mom & Dad home with a container full, and for mixing with the leftover butternut squash soup from Christmas Day to make yet another spontaneously created one of a kind culinary experience. 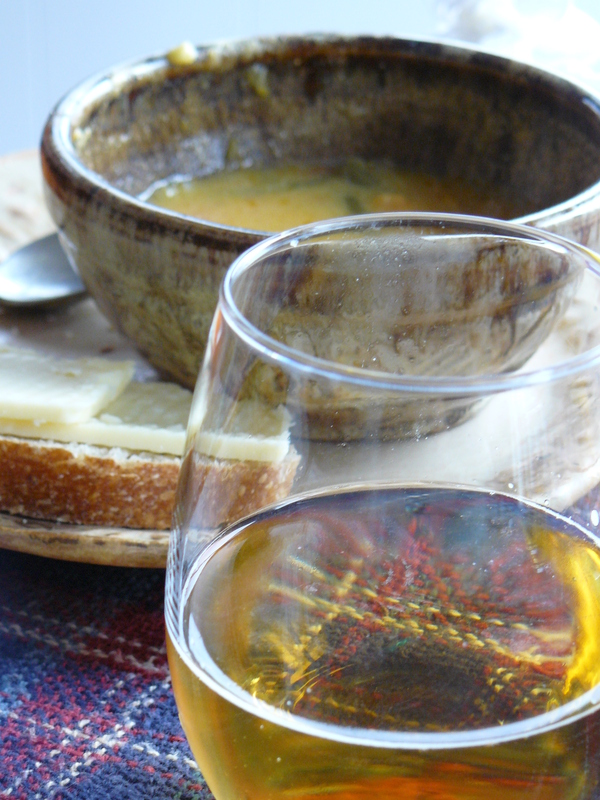 reflected in the translucent golden crisp hard apple cider we celebrate this meal with. It’s not just the soup, but the scene created around it, reminding me that the birds too might be considering the context for their next source of nourishment. 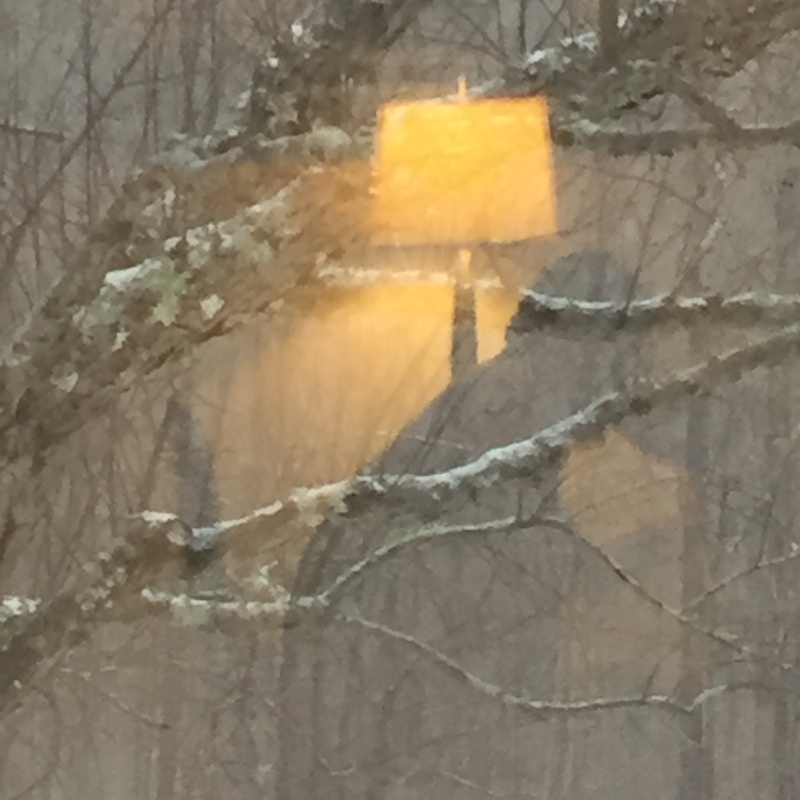 The reflection from the inside this morning is of Ben and Nora, heads together in mutual affection. Even on this bleak and cold morning, the feeling is of warmth and love. This too will always be part of the context that will attract the visitors. Soon Ben will return to school and it will be just me and Nora again, watching for the visitors outside. I’ve just mixed things up a bit, added some bread crumbs to the seeds. I’m holding the energy of this past week of making feasts. I have to believe that the birds will soon enough discover this new source for their feasting too. ahh, my heart is so warmed by your sharing these moments of life. These precious life moments like a recipe shared, brilliantly crafter to make a life well lived. Touching and inspiring!